Dr DeYoung is chairman of physical science at Grace College, Indiana. He holds a B.S. in physics from Michigan Technological University, an M.S. in physics from Michigan Technical University, and a Ph.D. in physics from Iowa State University. He has published technical papers in the Journal of Chemical Physics and the Creation Research Society Quarterly. Dr DeYoung is the author of eight books on Bible-science topics. 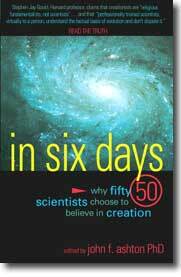 During my early years of physics training, I was not a six-day creationist. The literal view simply was not known to me. My professors and textbooks described in great detail the big bang origin of the universe and also our animal ancestry. Then one day a scientist colleague challenged me to consider the possibility of a recent, supernatural creation. I have been considering this exciting idea with great interest ever since. My scientific belief in creation is largely based on two thermodynamic laws of nature. In fact these are the two most basic laws in the entire science realm. The first law states that energy is conserved or constant at all times. Energy, in whichever of its many forms, absolutely can be neither created nor destroyed. This rule ensures a dependable and predictable universe, whether for stars or for human life. Energy conservation likely was established at the completion of the Creation Week. At this time the Creator ceased the input of energy into the physical universe from His infinite reserves. This fundamental energy law cannot be disobeyed like a man-made law. Only the Creator has the power to lay His laws aside, for example with miracles. Energy conservation implies that the universe did not start up by itself. Energy decay further implies that this universe cannot last forever. Secular science has no satisfactory explanation for such laws of nature. These principles simply transcend natural science. Their origin is supernatural, which by definition does not require a long time to develop. The addition of long ages of time is an unnecessary and confusing complication. Instead, these laws are entirely consistent with the biblical, six-day creation.